TEMPE – Earning a victory in their season opener, the Arizona Cardinals relied on a formula that helped make them a surprise playoff contender last year. With a rookie receiver John Brown scoring the go-ahead touchdown and Tommy Kelly, a 33-year-old castoff from the New England Patriots, playing well in place of injured defensive lineman Darnell Dockett, new players held key roles in an 18-17 win over the San Diego Chargers on Monday. Head coach Bruce Arians said he has one word for being successful with his new players, especially the replacements. Case in point: Kelly, a defensive end picked up from the Patriots late last month, recorded two tackles and provided significant pressure against quarterback Philip Rivers and a mostly veteran Chargers offense. The Cardinals had one of the NFL’s top defenses last season despite injuries to key linebackers, with veteran John Abraham recording 11.5 sacks and replacements filling in ably. As with last season, Arians said he didn’t have many other options Monday but that embracing the gamble is key to playing replacements. “I had to do it out of necessity and it worked. Don’t be fearful of it,” he said. Arians may have to do it again with Frostee Rucker, another veteran called upon to help replace Dockett, expected to be sidelined at least for Sunday’s road game against the New York Giants due to a calf injury in Monday’s game. “We’re not gonna stand pat with these rosters,” he said. While last season didn’t end the way the Cardinals wanted despite a 10-6 record, Arians said the team’s belief in the system works from year to year, regardless of a changing roster. Larry Fitzgerald recorded just a single reception for 22 yards on Monday and wasn’t a target until the fourth quarter against the Chargers, leading to criticism of quarterback Carson Palmer and the offense. In Palmer’s defense, Arians said that the offense isn’t designed for a single receiver. 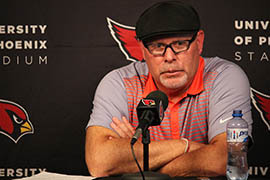 Arizona Cardinals Head Coach Bruce Arians answers questions during a news conference Tuesday.